Well, I guess we know what my summer project is: refinishing that table! 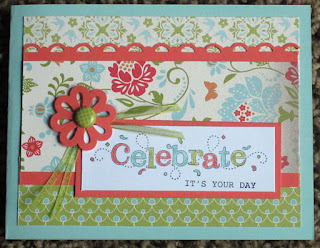 I just can't get over how pretty this paper pack from Sale-a-bration is! I think I find something new to love about it every time I look at it. The color combos are so fresh and bright, yet feminine and soft, and goodness! Versatile - I can see the colors lending themselves to some nice masculine cards as well! 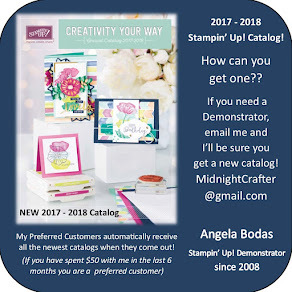 More information on the Sale-A-Bration event HERE. 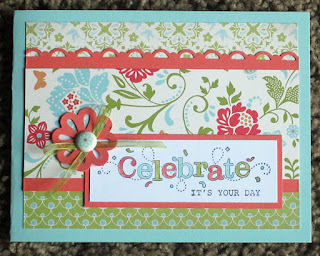 This week was my moms birthday and I was searching for ideas for a good card to make her, when I ran across this beautiful layout over at http://www.cardsscraps.com/. I shamelessly CASED the card. I made an matching envelope for it. And wouldn't you know it?! 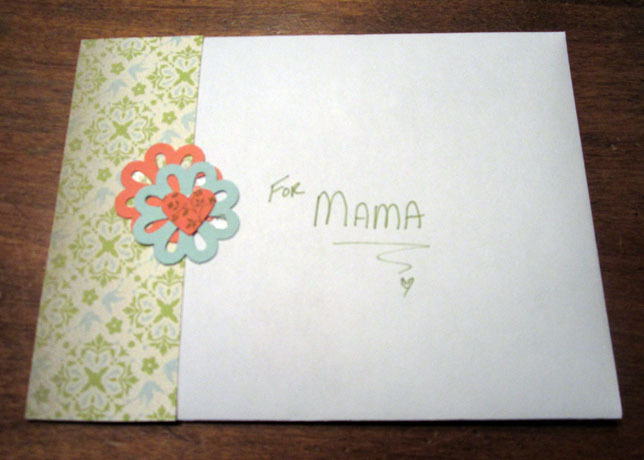 I put the card in and sealed it before I took any pictures... as they say on Twitter: SMH! At least my Mom liked it. So today I used my crafty hour to make a couple more cards. And lucky you, I took photos!! 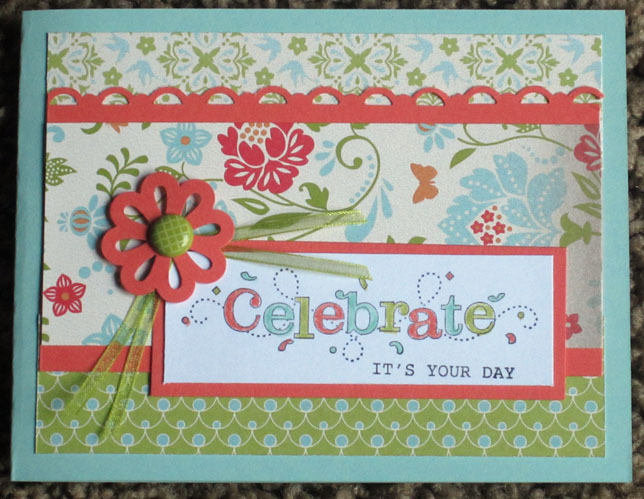 The sentiment is another SAB (Sale-a-bration) set Outlined Occasions # 126016. I stamped it in Black and then used my Blender Pen #102845 with the Pool Party, Calypso Coral, and Lucky Limade ink pads to color in the letters and confetti. I still buy some markers, but usually I will just buy the ink pad and use my Blender Pen to color images. On one hand this is very economical, but the real truth is I am just not that good at coloring and I do not do it very often, thus my lack of a marker collection. One of those things I would like to work on, but probably won't make it to the top of the list. Now you know. I also have a couple more projects I'm working on, the first in que being my card for Festive Friday this week - hope you'll come back and see that one on Friday. And I will be adding the refinishing of my craft tables to the list for the warmer weather. Haha! 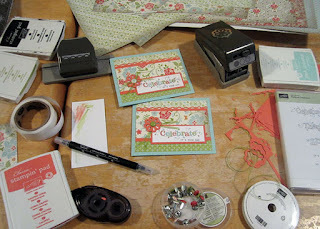 I suppose I should add to the list the "reveal" of my craft room - I don't think I ever posted any photos. It is still a work in progress, but at least after a year in the works it can now host visitors! One thing I really liked about the original card was that the complete design includes decorating the inside of the card. That really finishes a card off, in my opinion, adding a small coordinating design element to the inside. 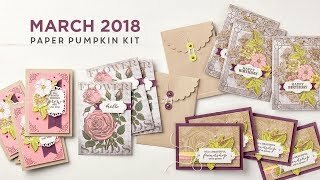 For these cards I will be making the matching envelopes and adding a flower or a strip of the DSP to the inside of the card. But that will have to wait for after dinner and baths and story time and bedtime for those little crafters of mine... back to Mama mode!